We keep a wide range of parts in stock for our workshop and Dr Bike repairs. We can also source most parts quickly through our various distributors including Shimano, Sram and Campagnolo. With our focus on bike maintenance courses, we keep a range of common tools in stock and can order specialist tools from DAG tools to headset presses. We’re always happy to offer advice on tool selection and can put together custom tool kits for tackling specific fleets of bikes. All customers of our maintenance training courses will be offered a discount. While we can source most tools, we also sell our Head Mechanic’s specially selected tool box kit. Catherine’s Home Mechanic tool box has a wide range of tools for all the most common repairs from changing chains and cassettes through to cutting cable outer. The tools have been carefully selected to offer a great balance of quality and value. The full kit retails for £200 including free tool box and you can read more info here. 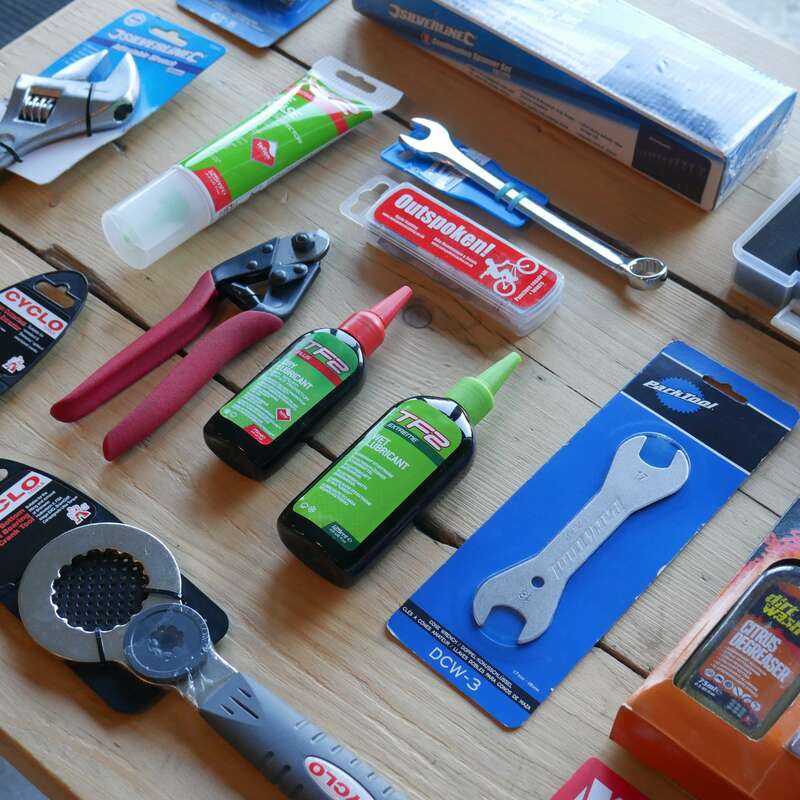 With years of experience providing Velotech course participants with advice on toolkit selection and spending many a winter out at Dr Bikes, our Head Mechanic, Catherine, knows a thing or two about which tools can be relied on time and time again. After popular demand she’s put together a carefully selected tool box for keen home mechanics and anyone servicing fleet bikes. Composed of specially chosen tools from a range of companies it represents a great combination of quality and value. Perfect for courses participants and a great gift for budding mechanics! We also provide a range of tools for more specialist jobs as well as lubricants and toolstands. Purchase of the full home mechanic kit includes a FREE toolbox to keep all your shiney new tools safe and sound in. A break down of the included tools in the main kit are listed below . See our list of our most popular tools as a PDF here. Anything else you want, just ask! To place an order or for advice on tool selection with one of our mechanics do get in touch!